The image shows a giant dragon in the sky. 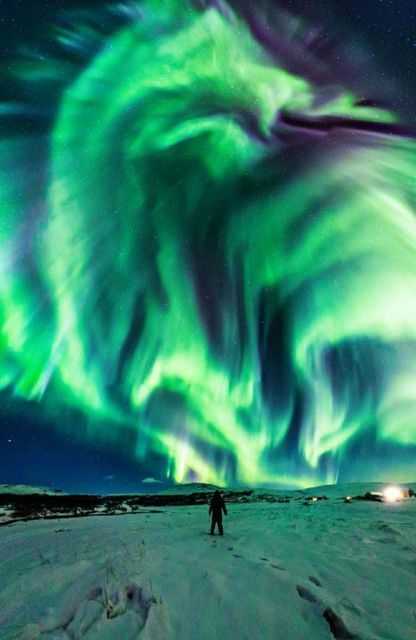 NASA posted a stunning image of a dragon-shaped aurora in Iceland's winter sky on February 18th. "The aurora was caused by a hole in the Sun's corona that expelled charged into solar wind that followed a changing interplanetary magnetic field to Earth's magnetosphere," NASA reported. The photo was captured by photographers Jingyi Zhang and Wang Zheng and it clearly shows a huge dragon-like creature in the night sky. 7 a griffin-like image was captured on Reykjavik and a recent image taken by Scottish snapper Graeme Whipps in Iceland shows a giant-like face in the sky. Interestingly the Icelandic coat of arms features four protectors of the country, called Landvættir in Icelandic. The four protectors of Iceland are: a dragon, a griffin, a giant and a bull. Now all that is needed is someone capturing an image of a bull in the sky! If any of our readers find a bull-like aurora and manage to get a photo of it, please send it to icelandmonitor@icelandmonitor.is!